The news broke on futsuka-me, the 2nd day of the Kyushu basho. To the general surprise and distress of his fans, Mongolian Kyokushuzan, current maegashira 10 east, announced his retirement (intai) with great emotion. He did not present himself on the dohyo, granting a free victory to Kitazakura, another veteran of the professional divisions. Batbayar Davaa, his real name means “strength and joy”, was born on the 8th of March 1973 in Ulan Bator. He grew up surrounded by the love of his parents, his three sisters and his brother. His family, his Mongolian wrestling coach, and his first girlfriend unanimously describe him as naughty and cheeky as a monkey. Like most boys his age, Batbayar practised Mongolian wrestling diligently, working tirelessly on some of the 666 techniques of this ancestral art, no doubt dreaming of equalling or even surpassing the heroes of the discipline. And like most boys, he also dreamt of becoming a policeman. But fate made a different choice for him. One fine day, he noticed a small advertisement: “Oshima oyakata, former ozeki Asahikuni, is in Mongolia to recruit new talent for his sumo stable in Japan.” The young man presented himself among 120 other young fighters and was selected, together with the future Kyokutenho and Kyokutenzan. Thus, at 18 young Batbayar began his new life in the Land of the Rising Sun, and was parachuted into the pitiless world of sumo. In spite of having difficulty adapting to this hierarchical world, to the food and to the Japanese language, which are all so different from his country of origin, the young fighter stuck to it. He worked relentlessly and climbed through the ranks, which brought him to the top division, and even a breakthrough into sanyaku, only 6 years after his arrival in Japan. It should be said that his playful character, his humour, his round and merry face, and his talents as a singer and guitarist greatly eased his integration into the heya and his popularity with the Japanese public. After his mae-zumo debut in March 1992, Kyokushuzan (kyoku=morning sun, shu=eagle, and zan=mountain) flew through jonokuchi, jonidan and sandanme divisions in barely a year and a half, anchoring himself firmly in makushita, where he took the zensho yusho at the Hatsu basho in 1995. In July of the same year, he won the juryo yusho, at the rank of J13e. 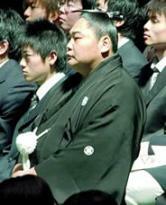 He won his 2nd juryo yusho in the Haru basho of 1996 and joined the makuuchi division in September of the same year. He was the first Mongolian fighter to reach this division. He was thus celebrated as a hero in Mongolia. Only two tournaments later, he gained the rank of komusubi. It was at this time that he published his first biography, "From the Steppes to Sumo" which became, against all expectation, a bestseller in Japan. He published a second, some time later, this time assisted by a writer. Fallen from the sanyaku ranks never to return, Kyokushuzan settled permanently in the top division and became the archetypal elevator rikishi, going up and down the banzuke. There is nothing very original about that; he shares this characteristic with many other fighters. But his uniqueness lies in the fact that he pioneered a new style of sumo, which is light, spiritual, elegant, almost dancing, with its basis in the many techniques of Mongolian wrestling of which he is such a master. A twirling pixie, he thrilled or aggravated fans, depending on taste, but undoubtedly he was a breath of fresh air, which the sumo world seems to need. However, during his time in the lower divisions, Kyokushuzan drew great advantage from these techniques and many of his opponents were injured, surprised by his “tricks” that came out of the blue. His technical repertoire was such that he was called “gi no depato", the supermarket of techniques. Eventually, the NSK formally banned him from using them. To our knowledge, the only other rikishi to whom that has happened is Raiden, who killed an opponent with a tsuppari. Several prizes mark the career of “the eternal maegashira”: two gino-sho, (Hatsu basho 1997 and Natsu basho 2002), a shukun-sho (Natsu basho 2003), two kanto-sho (Natsu basho 2005 and Haru basho 2006), not to mention his record of 58 consecutive tournaments in makuuchi. During the Natsu basho of 2002, he even produced a very rare zensho kachi-koshi at 8-0 with 8 different winning techniques, earning him his brilliant 2nd gino-sho. He also bagged 5 kinboshi from 4 different yokozuna: Akebono (Natsu basho 1997), Wakanohana (Haru basho 1999 and 2000), Musashimaru (Hatsu basho 2002) and Asashoryu (Natsu basho 2003). The only one that he failed to nail was the great Takanohana. He lacked only a family to be a fulfilled man. The stork soon responded to his call at the beginning of Spring 2000. His fiancée Buyanbileg, a young Mongolian who had been studying in Japan, gave birth to their little girl, Ariunzaya. The two lovebirds married on May 27 in the famous Hakozaki Park Royal Hotel in front of more than 800 guests. A little boy came later on to increase his family. We guarantee that the little fellow will very soon start Mongolian wrestling and sumo, if he has not already done so, dreaming of following in the footsteps of his hero of a father. Feeling less powerful at the end of his career, Kyokushuzan practised a sumo of “flight”, which was very defensive and displeasing to the public, especially after his years of flamboyance. He mused on a change of profession and what he would be able to do for his country. He had heard about a correspondence course with the prestigious Waseda University for a Master of Science Degree in telecommunications. Without high expectations, he applied and, to his great surprise, was accepted on 1st April 2004. As this news was no April Fool’s Day joke, he decided to carry out his studies in parallel with his sumo career. He also became involved, it goes without saying, with the university sumo club and guided some of his pupils to great results (see MDS #6). The “supermarket of techniques” has just closed its doors permanently. The career of Kyokushuzan, Shu to his friends, moves to politics. He will in fact stand in the legislative elections in his country in 2007, hoping one day for the post of Foreign Minister, in order to become a bridge between Japan and Mongolia, something for which he has always worked. But he doesn’t hide the fact that his ultimate ambition is to be President of the Republic. With him in this post, the members of the government are likely to have fun! Kyokushuzan has some more immediate projects, however. A ceremony in his honour has just been held in Ulan Bator in the presence of the Prime Minister, his parents, Kyokutenho and other Mongolian rikishi, and also 500 fans. The newly-retired Kyokushuzan thanked them all for their support during his years in Japan. “Kyokushuzan contributed to strengthening the ties between Mongolia and Japan”, declared the Prime Minister. The hero of the day was named an honorary citizen by the president of the town council of Ulan Bator. His danpatsu-shiki, which was unexpectedly going to take place in Mongolia, will now happen at the Kokugikan in Tokyo on the 2nd of June 2007, which will silence the rumours, which claim that the Mongolian ex-rikishi did not dare return to Japan fearing reprisals from the yakuza from whom he borrowed and failed to repay a large sum of money. A page of the great Sumo book has turned. We won’t now see the dazzling spectacle of the Mongolian magician and his “tricks” on the dohyo. It only remains for us to take off our hats in to salute the artist! career records of former komusubi Kyokushuzan.